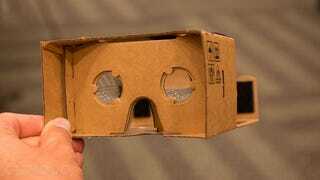 Remember that fun little cardboard VR headset Google trotted out at Google I/O? Remember how it wound up being one of the coolest things there? Google does, and that's probably why the search giant is upping its cheap VR game. In a post on its developer blog, Google notes that it shipped over half a million of the dirt cheap user-your-phone VR headsets already, not to mention companies like DODOcase, which are selling their own versions based on Google's specs. The fun doesn't end there. Cardboard VR apps are now getting their own section on the Play Store now, Google's planning to build in calibration settings to the Cardboard SDK to make sure that VR apps work just as well in all different varieties of cardboard viewers, and Google's even hiring people on to make it all work. That means more apps, more support, and more Google-brainpower devoted to making an already awesome little gadget even awesomer.